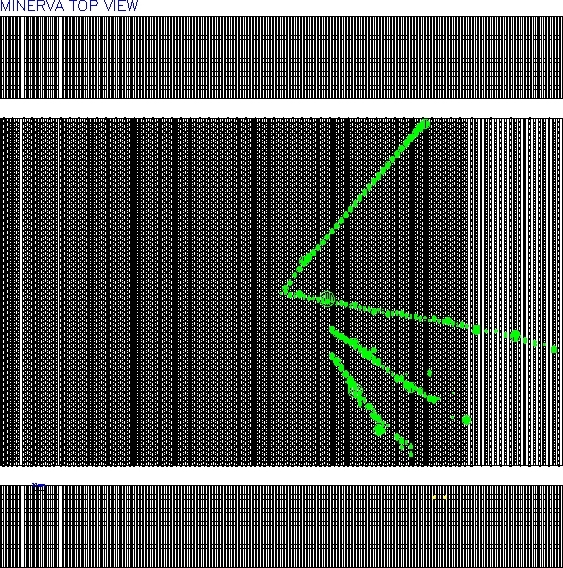 This is the final article in a series on the MINERνA neutrino experiment. The MINERvA experiment will undertake "hard and challenging science" while aiming to build a knowledge base of neutrino properties that is inherently intriguing and will be critical in experiments studying neutrino oscillations. MINERvA scientists want to fill the gaps left over from the early days of neutrino experiments, where studies of low-energy (1-10 GeV) neutrino cross sections were hindered by limited data and large errors from bubble chamber detectors; and the gaps from the current higher energy neutrino experiments with detectors not designed to study low-energy cross sections and nuclear effects. "We're working in a very difficult energy range [1-10 GeV], where interactions with quarks, with nucleons even with nuclei are all intermixed," says MINERvA cospokesperson Jorge Morfin. "As we traverse this energy range, we proceed from where the neutrinos interact simply with a neutron to yield a proton, through production of complex nucleon resonances, to deeply inelastic scattering of neutrinos with the quarks making up the nucleons. MINERvA is looking at that whole energy regime. It's hard and challenging science, but it's a transition region we must understand." Describing this transition region is also difficult for Quantum Chromodynamics (QCD), the theory of the strong force interactions among the quarks and gluons within the nucleons. This study of QCD offers a significant opportunity for complementary physics with research at Jefferson Lab in Virginia, where scientists are working with 1-6 GeV electrons. Some of these scientists are now also collaborating on MINERvA, using the unique ability of neutrinos to select the flavor of quarks for their interactions: neutrinos can differentiate up, down, charm and strange quarks. Combining the neutrino results with electron scattering results from Jefferson Lab yields a new picture of low-energy QCD. MINERvA will study another crucial issue: what happens when the neutrino interacts within a heavy nucleus, and all the nuclear effects take place? 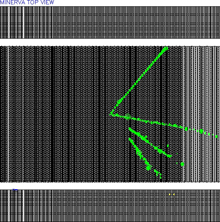 Very seldom do massive neutrino detectors measure what actually was produced at the neutrino interaction point. Nuclear effects have masked the properties of the original interaction. To complicate matters further, the theoretical predictions can be very different for the effects of a neutrino hitting the nucleus as compared to an electron hitting the nucleus. With three different materials in its detector - carbon, iron and lead - MINERvA hopes to carefully measure these nuclear effects. AURORA � Make no bones about it � if you like dinosaurs, you're going to want to be at the SciTech Museum on March 26. That's the opening date for the largest exhibit in the museum's history, "Dinosaurios Argentinos: Giants of Patagonia." Featured will be complete replicas of seven enormous dinosaur skeletons from Argentina, shipped and painstakingly reassembled by Buenos Aires' own Oscar and Fabio Frachtenberg and their company, Grupo Cultural. Spiral galaxies look bluish. Galaxies that are farther away appear more yellowish. Galaxy clusters are known to favor elliptical galaxies. Unless you're an astronomy aficionado, you may rarely or never ponder what you see in the sky at night. You might argue that even if you looked, you wouldn't know what you're seeing anyway. It's just a bunch of points of light up there. But not to astrophysicists like Steve Kent, who is involved in the Sloan Digital Sky Survey. Over the past five years, the survey has imaged more than 8,000 square degrees of the sky and detected nearly 200 million celestial objects. By measuring the spectra (wavelengths of emitted energy) of 675,000 galaxies, astrophysicists have been able to determine their distance from us. "They've all been moving the same amount of time, which is the time since the Big Bang, so the ones going faster have gotten farther away from us," says Kent. "Because they're moving away from us, the light wave lengths are longer. That's the redshift effect." 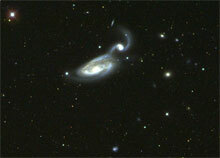 Galaxies are generally classified as spiral, elliptical, lenticular (visually these often look like a cross between spiral and elliptical), and irregular. "It was an early theory that maybe elliptical was the first stage and spirals were later. That doesn't work," says Kent. "They do change their shapes due to the fact that they can run into one another. The universe is filled with train wrecks. Think of a demolition derby." The Sloan Digital Sky Survey finished its first phase in June 2005 and has already entered its second phase. Data collection in the second phase will continue until June 2008. John L. LaFleur, Fermilab electrician, died Sunday, March 26, at Delnor-Community Hospital in Geneva after complications from a brain tumor at the age of 49. Visitation will be from 3 to 9 p.m. Friday, March 31, at Moss Family Funeral Home, 209 S. Batavia Ave., Batavia. Funeral Mass will be at 10:30 a.m. Saturday, April 1, at Holy Cross Catholic Church, 2300 W. Main St., Batavia. Burial will follow at West Batavia Cemetery in Batavia. You can read the obituary here. Dan Parkhill, formerly of FESS-Ops/Engineering passed away on Sunday in Aurora. He was 60 years old. Visitation will be from 5 to 7 p.m. on Wednesday, March 29, 2006 at the Turner Funeral Home in Somonauk with prayers at 7 p.m. Visitation and funeral mass services will continue in Clark, SD, on Saturday, April 1 from 11 a.m. to time of services at 1 p.m. at St. Michaels Catholic Church with burial to follow at St. Boniface Catholic Cemetery. You can read the obituary here. Employees and users are invited to attend a memorial service at Fermilab for neutrino physicist and MINOS co-spokesperson Doug Michael on Friday, March 31, at 1:30 p.m. Michael died on December 25, 2005 after a year-long battle with cancer. The service will be held at the MINOS detector building (a short walk from the Lederman Center) and includes the planting of 5 trees. There will be a Unix users meeting on Wednesday, March 29 from 1:00 to 2:30 p.m. in Curia II. Network experts will talk about Firewall, Security experts will demo SeanMeNow, and the Linux support group will talk about Hepix and Linux updates. Wellness Works presents a Brown Bag Seminar on Thursday, March 30, between 12-1 p.m. entitled "Cholesterol Countdown: How to lower your cholesterol by changing your diet." The seminar will be presented by Michele Kinzler, Registered Dietician and Licensed Dietician.